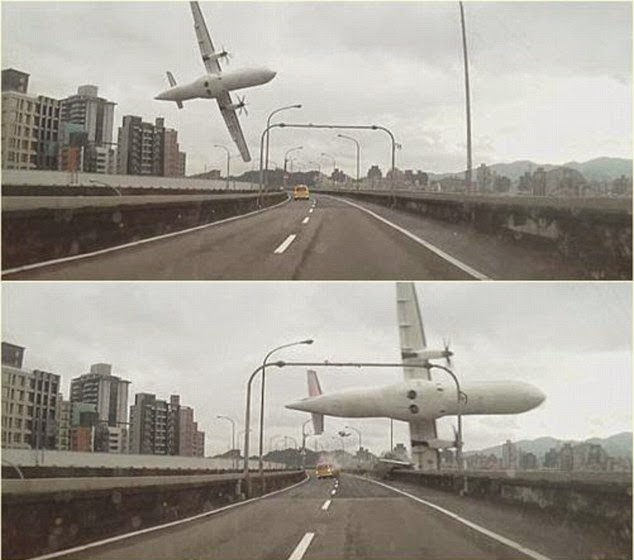 TransAsia Airways GE235 plane crashed into the Taiwan River earlier today with about 58 people on board, and up to 23 are reported to be dead, with several more injured, including two infants. As more photos from the crash emerge, it has been reported that the small passenger plane clipped a road bridge and crashed into the river. Dozens of passengers remain unaccounted for as the rescue operation in the capital city of Taipei continues. Terrifying footage of the disaster, filmed by a passing motorist's dashboard camera, showed the aircraft plunging into the water only three minutes after taking off from an airport which was 5km away. Many passengers are still believed to be trapped inside the TransAsia Airways GE235 plane while those that have been rescued have been taken to hospital,The Straits Times reports. A taxi driver was also taken to hospital after suffering severe head injuries and concussion when the plane crushed his vehicle before colliding with the bridge. On board the plane were 53 passengers and five crew, 31 of whom were tourists from mainland China.